Powers/Abilities: Jackie is empowered with the Darkness. He can create virtually anything, including living , sentient beings, out of shadow. However these creations will turn to dust upon exposure to daylight. 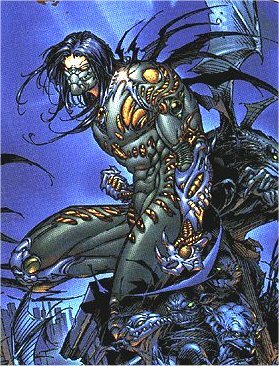 His power is the natural adversary of the Witchblade power. History: "I am powerful... I am immortal... I can do anything... I am cursed... I am the Darkness." Jackie Estacudo was an orphan. As a young boy he was taken from the orphanage he was in by Frank Franchetti, head of the Franchetti Mafia family, and raised as his son. The Don raised a ruthless killer, because he had come to genuinely love his surrogate son, and wanted to see him survive in their cutthroat business. Jackie grew up to be a hitman for the Family, living the high life of a top assassin, full of fast cars, fast women, violence and money. Then he turned 21 and came into his real inheritance; a supernatural force, a curse, known as the Darkness. This was a power diametrically opposite to that behind the Witchblade. At first Jackie found his new abilities to be really cool, but then he discovered one of the price tags attached to it; if he ever impregnates a woman, creating an heir for the power, he will die. The power can only have one holder at a time, and the wielder only gives it up by dying. As stated Jackie's powers surfaced on his twenty-first birthday, the same day he was sent to kill Sara Pezzini (see Witchblade). While he was trying to kill her, the power of Darkness overtook him. Sometime later he would encounter her again, this time as an ally, for though their powers are diametrically opposed, the wielders aren't always. Other problems started to arise. First there was Sonantine and his Brotherhood of Darkness, a cult which worshipped the holder of the power...so long as that holder agreed to the Brotherhood's plans to rewrite the world to suit themselves. If the incumbant didn't concur with this view, and Jackie didn't, then the Brotherhood felt it their duty to ensure the power was past on to someone more worthy as soon as possible. It turned out that it had been Sonantine who had first suggested adopting Jackie to Don Franchetti, having told the mob boss that the child would be able to aid the prosperity of the Family in the future. Then there was the Angelus Queen and her minions, who had been created centuries ago by another person under the curse. They had survived all this time by draining the life out of several previous inheritors, each time growing more powerful. And the didn't see why Jackie should be an exception to this lifestyle choice of theirs. But in spite of all this, Jackie intends to continue to live the life he always had, no matter who he has to kill to do so.